Steve Smith’s “Snow Cones.” Photo courtesy of Sunnyside Nursery. If you are like me, you went to bed last Sunday night with a light dusting of snow on the ground and woke up to eight to ten inches covering virtually everything in the garden. Now, somewhere underneath that white stuff, are my blooming hellebores, snowdrops, and budded daffodils. You might ask: “Is all lost?” Hardly! Snow is an amazing insulator, as long as you don’t disturb it. Rule number one is to always leave snow alone in the garden. The light, fluffy structure of newly fallen snow is much like that spun fiberglass insulation that we put between the 2 x 4’s in our homes. 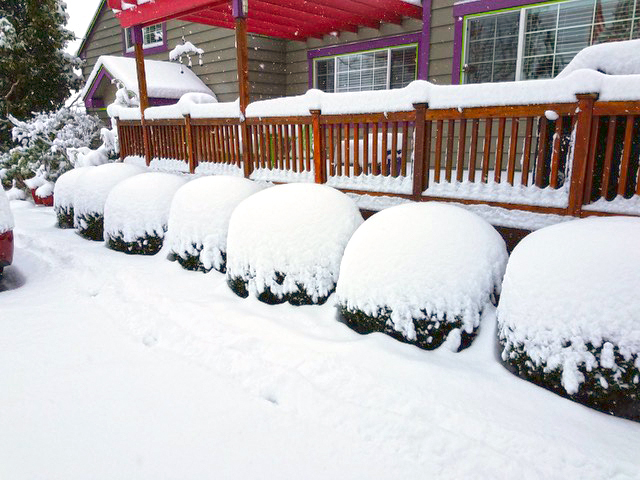 A six-inch or more covering of snow can add five to ten degrees to the soil surface temperatures and be the difference between life and death for tender plants. The only time I remove snow is when it is weighing down my evergreen shrubs and causing them to splay out. For everything else I just leave it in place and pretend I have a garden full of snow cones. It’s kind of a novel look that I have often thought of enhancing with the aid of some food coloring, but alas, my wife has always squashed the idea. “Party pooper” comes to mind. Another benefit of snow is the nutritive value. It is actually known as “Poor Man’s Fertilizer” because of the nitrogen it contains. As snow falls, it removes nitrogen from the atmosphere and over time that nitrogen gets converted into nitrates that plants can absorb and use for growth. I have personally noticed how much greener my lawn looks after a snowfall and it is due to the addition of nitrogen. I even had a neighbor walk by the other day and, tongue in cheek, wish me Merry Christmas. So, go make a snowman and have some fun with this rare weather event. Don’t worry about the garden, it will be fine. Just make sure you stay off the lawn and out of the beds until it melts. Sunnyside will be hosting a free class - PNW Fruit Trees on Saturday, January 26, 2019, at 10:00 am and 2:00 pm; and again on Sunday, January 27th, at 11:00 am.